Custom badges are unique name badges that contain full employee info. Unlike reusable name badges, custom badges are one & only in the sense of style for each team member. Original custom badges are inexpensive to print using MakeBadge badge maker! All you need to do is to select a template for custom badge design and to unleash your creativity. Click “Get Started” button to make any number of customized badges free and quickly. Download your custom badges and print them for free. 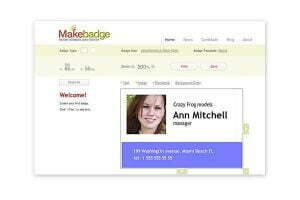 Go ahead and create free custom badges online!